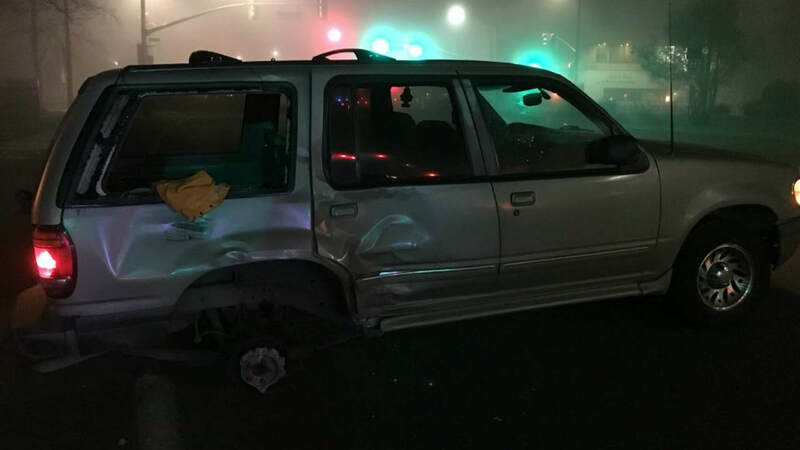 SANTA ROSA, Calif. -- An 18-year-old man was arrested for hitting four pedestrians in Santa Rosa early Sunday morning after he lost control of his car, police reported. Santa Rosa police responded to a hit-and-run at about 1:48 a.m. near Fourth Street and Brookwood Avenue. Witnesses told police that a Ford Explorer struck several pedestrians on a sidewalk in front of a restaurant on the northwest corner of the intersection. Witnesses told police that the vehicle was missing a rear tire and it fled southbound on Brookwood Avenue. The driver allegedly ran out of the vehicle after it came to a stop near Second Street and Brookwood Avenue. After police and emergency personnel arrived, the four victims of the collision were treated for their injuries. Police set up a perimeter around the Ford Explorer, and used a K-9 dog to find the man a short while later, police said. The man was hiding in bushes near a business on Second Street, according to police, and he told officers that he had been the sole occupant and driver of the vehicle. Jose Gil Ortiz-Ortiz, an 18-year-old Graton resident, was arrested for a felony DUI and a felony hit and run. Police said he was first taken to the hospital and officers later learned he was under the influence of alcohol. All four victims of the accident have significant injuries but are expected to survive, according to police. Southbound Brookwood Avenue from Fifth Street to Second Street was closed during the investigation, police said, but traffic was not affected because it was so early in the day. Anyone with information about the accident is asked to call Officer Jeff Adams at (707) 543-3636.